Lomba Dantiwala Begun Bhaja and Gol Muchmuche Begun Bhaja, two avatars of Bengali fried Eggplant! Can Begun Bhaja be a recipe I should write! Is it at all worth writing this super easy recipe! After all, Begun Bhaja is nothing but fried eggplant quoted with turmeric and salt (I use little chili powder as well). Then I asked myself, is it about what I must or what I want and I decided to come up with this post on Begun Bhaja. It actually is not the recipe but the emotion that matters. 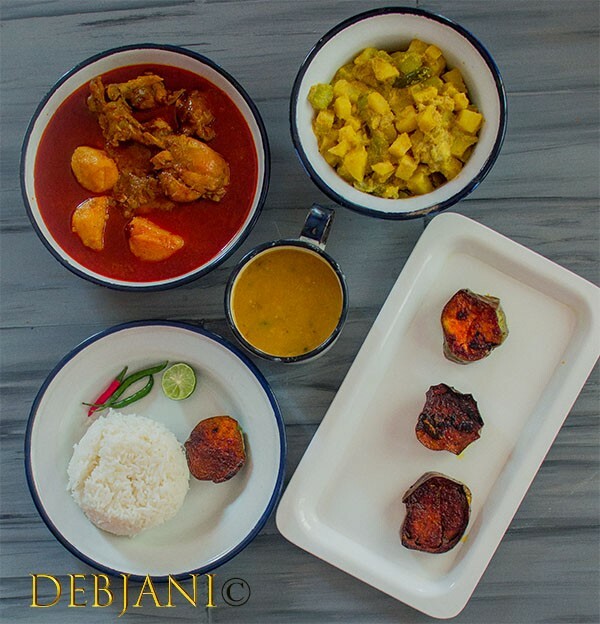 The humble Bengali Begunbhaja, has to be there on my blog period and here it is. 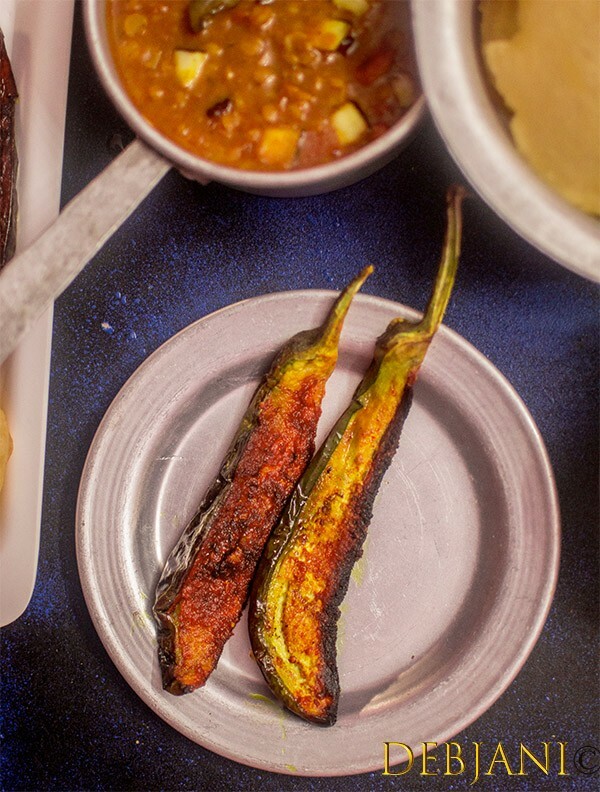 The Famous Bengali style deep-fried eggplant or Aubergine is Begun Bhaja. Believe me, I was in dilemma. Given this is something that we make and eat in the Bengali households almost every alternate day or so. Be it the plate full of Rice and Dal or Puffed Luchi or humble Roti, Begunbhaja is, needless to say, the perfect companion. While I started drafting this post, I realized I actually have much to say. Lomba Dantiwala Begun Bhaja or Gol Muchmuche Begun Bhaja! 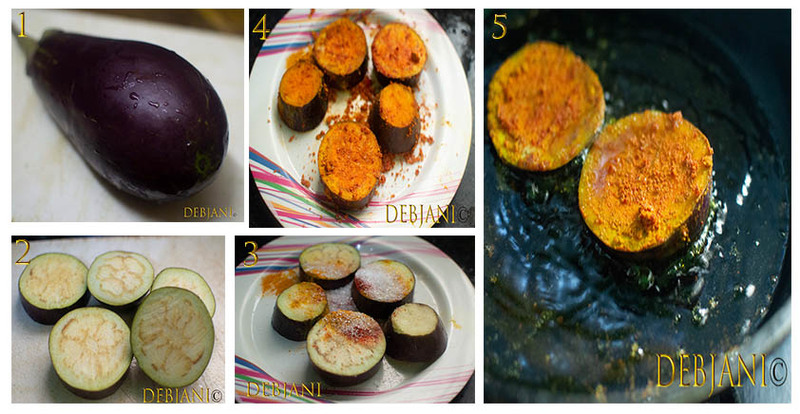 The Bengali Fried Eggplant and types! Well, the humble Begun Bhaja has different forms! 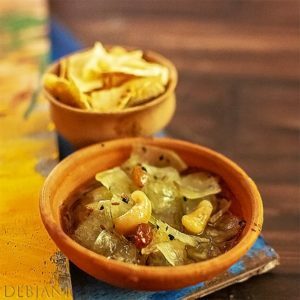 When paired with Luchi/ Kachuri or Roti, the Lomba Dantiwala Begun Bhaja works. While having with Rice, we prefer the Gol Muchmuche Begunbhaja. Now let me share what is the difference between Lomba Dantiwala Begun Bhaja and Gol Muchmuche Begun Bhaja. Talking about the Lomba Dantiwala Begun Bhaja, it is the elite form of Begun Bhaja, well according to me. I remember, having this in the Marriage Dinners along with Luchi which is a rare occurrence these days. Frankly speaking, I used to go to the “Biye Bari” just to savor the Lomba Dantiwala Begun Bhaja along with Phulko Luchi. Lomba means long and danti stands for the stem. 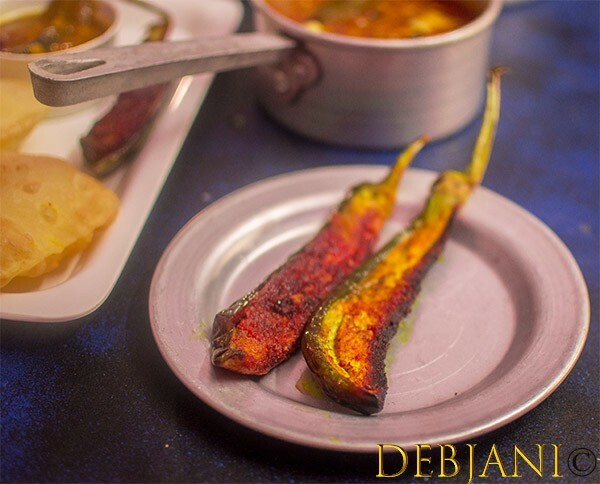 In short, Lomba Dantiwala Begun Bhaja is nothing but long fried Eggplant with a portion of the stem attached. Gol Muchmuche Begun Bhaja, on the other hand, is the humble form of Bengali Fried Eggplant. Having this with piping hot rice and Daal is still regular at home. The Eggplant cut into roundels and then fried after little marination and this form, needless to say, is the epitome of comfort. According to my mother, the trick is the marination and the proper cut. Also, quality of the Eggplant matters. 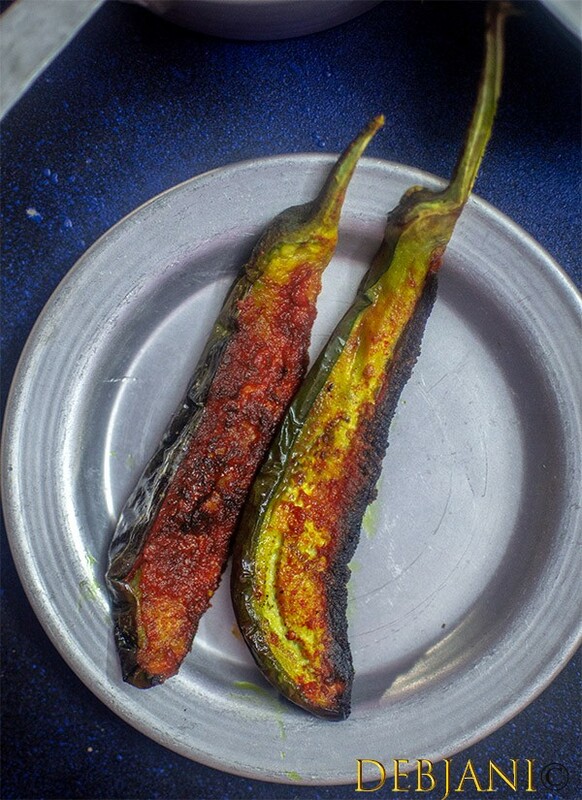 The right amount of Mustard oil, properly marinated Eggplant and frying on slow flame is the key to getting crunchy yet properly cooked Begunbhaja. Without these, you may get soggy Begunbhaja with loads of unnecessary Oil. Here is how you make Begunbhaja! I am sharing both the recipes separately for the ease of the readers. Choose whichever you prefer and thank me later 😉 . Lomba Dantiwala Begun Bhaja is a simple fried form of Eggplant and is a famous Bengali delicacy served as a side with flour-based puffed bread such as Luchi. Wash Eggplant under running water. Cut the Eggplant longitudinally as shown in the picture with a portion of the stem. Basically, the stem will be cut into pieces along with the flesh. One medium-size Eggplant to be cut into 6-8 long medium-thick portions. Now sprinkle Turmeric Powder, Red Chili Powder, Sugar, and salt over the Eggplant and rub the spices. Leave the marinated eggplant for 15 minutes before frying. Heat Oil in a pan and then keep the flame medium high. Sprinkle little wheat Flour over the eggplant and coat lightly. 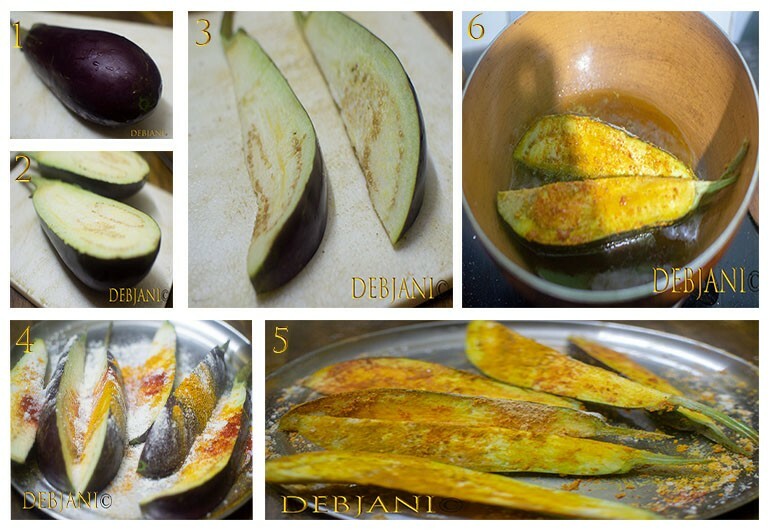 Now start frying the eggplants from both sides until crisp and light brown in color. Strain from Oil and serve Lomba Dantiwala Begun Bhaja with hot Luchi. Sugar is optional, however, caramelized sugar makes the Begun Bhaja more crunchy and also balances the flavor. Red Chili Powder is optional however, I prefer to use it to balance the flavor. In several families, they don't use chili powder. Wheat-flour is optional again, however, the light coating helps in getting crunchy fry. A comforting form of Begun Bhaja, Gol Muchmuche Begun Bhaja goes amazingly with Rice-based dishes. Cut the stem and discard it. One medium-size Eggplant to be cut into 4-6 long medium-thick portions. I don't use wheat flour while making Gol Begun Bhaja. The thickness of the Eggplant is enough to get the desired crunchiness without adding the flour. 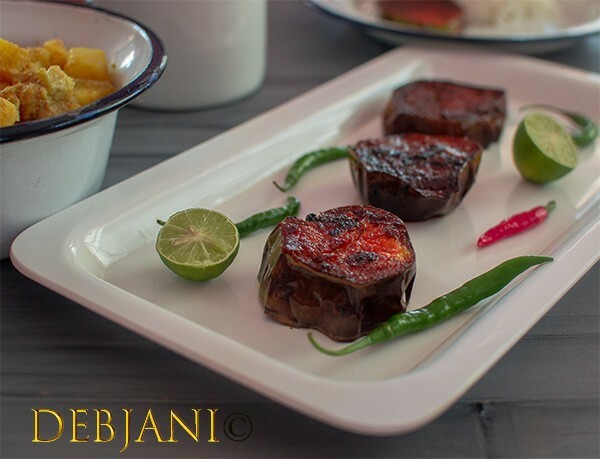 Have you tried the Begun Bhaja Recipe from Debjanir Rannaghar!